Thanks to a vivid and multi-ethnic history, San Andrés offers a varied cultural experience, from the cuisine of the islands to the languages spoken. Spanish is the official language but people also speak English to the background of salsa and reggae. The archipelago of San Andrés, Providencia y Santa Catalina, identified by UNESCO as a World Biosphere Reserve, is located 480 miles (720 km) northwest from the Colombian Caribbean Coast. It is made up of the islands of San Andres, Providence and St. Catherine, Bolivar and Albuquerque islets, Cotton, Haynes, Johnny, Serrana, Serranilla, Quitasueno, Rocky, and Crab cays and Alicia and Bajo Nuevo sandbanks. Orient yourself with this map from Expedia. San Andrés is conveniently on the Central American-Colombian route. By air via charter flights and international locations to Gustavo Rojas Pinilla on San Andrés. Avianca, Satena, and Aerorepublica provide service from Colombian cities. Select flights from your area. You can also browse for hotels and car rentals. By sea, from any port in the Caribbean. There are no ferries to the other islands or the Colombian mainland and the cargo ships do not carry passengers. Check today's weather and forecast. The islands' weather consistently averages 70 to 80+ F throughout the year with winds ranging from 5 mph to 15 mph. The dry season is from January to May, with another less-dry season during August and September. San Andrés is a duty-free port welcoming visitors to its lushly green landscape, isolated cays and almost private beaches. Most of the attractions of the islands come from nature and its history. Closer to Nicaragua and Jamaica, how the archipelago came to be a Colombian territory is the result of piracy, wars of independence, slavery, immigration, sugar, cotton, and religion. Originally settled by the Spanish in 1510, the islands were part of the Audiencia of Panama, then part of the Capitanía of Guatemala and Nicaragua. They attracted the attention of Dutch and English privateers, and reputedly Henry Morgan's treasure trove is hidden in one of the island caves. English Puritans and Jamaican woodcutters followed the pirates and it wasn’t until 1821 during the Wars of Independence that Francisco de Paula Santander took the islands and the Colombian flag was raised on June 23, 1822. Sugar and cotton plantations were the mainstays of the early economy and slaves were imported from Jamaica to work the fields. Even after the islands became Colombian territory, the English influence remained in architecture, language, and religion. The archipelago consists of two large islands, San Andrés and Providencia. San Andrés, at the southern end of the archipelago, is the largest island at 13 km long and 3 km wide. 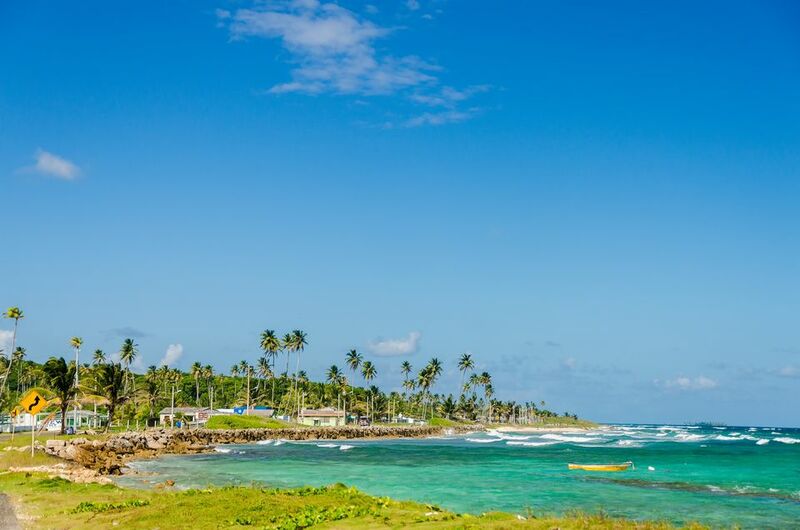 It is mostly flat, with the highest point being El Cliff overlooking El Centro, the local name for the town of San Andrés at the northern end of the island. Most of the tourism and commercial business is here. The island is walkable, but you can rent a scooter or moped to explore. Providencia is the next largest island, at 7 km long and 4 km wide. Located 90 km north of San Andrés, it was for many years quieter and less affected by tourism. However, it is rapidly becoming extremely fashionable and expensive. It is still a lure to snorkelers and divers who come for the extensive coral reefs and clear water. The interior of the island is tropical palms and pleasant. A walk from Casabaja to the top of the highest point, El Pico provides good views of the island. There are a number of hotels in El Centro as well as the Decameron resorts. Look halfway down the page of this typical tour from Tara Tours for information about the Decameron hotels: Aquarium, Marazul, San Luis, Decameron Isleño or Maryland. Island cuisine relies heavily on fish and local vegetables, accented with coconut, plantain, breadfruit, and spices. Make sure to try rondón, made with fish, pork, conch, plantain and coconut milk, either in a restaurant or from a roadside stand. From El Centro, walk up to El Cliff. At 50 m, it makes a pleasant stroll for good views of the town and coral reefs. Dive and snorkel in several locations. Calm undercurrents, moderate temperatures, and almost limitless visibility make this a prime attraction. Johnny Cay, also called Islote Sucre - the nearest small island to San Andrés offers white sandy beaches, transparent waters, and tropical vegetation. El Hoyo Soplador at the southern end of San Andrés is a seawater geyser, visible only under the right conditions. La Cueva De Morgan or Morgan's Cave - is a sea cave constantly enlarged by the water action against the rock walls. It's a popular attraction due to the natural effects and the treasure legend. La Loma - tiny hamlet where traditional island life continues. The Iglesia Bautista Emmanuel is the first church built on the island. Its spire served as a landmark for sailors.